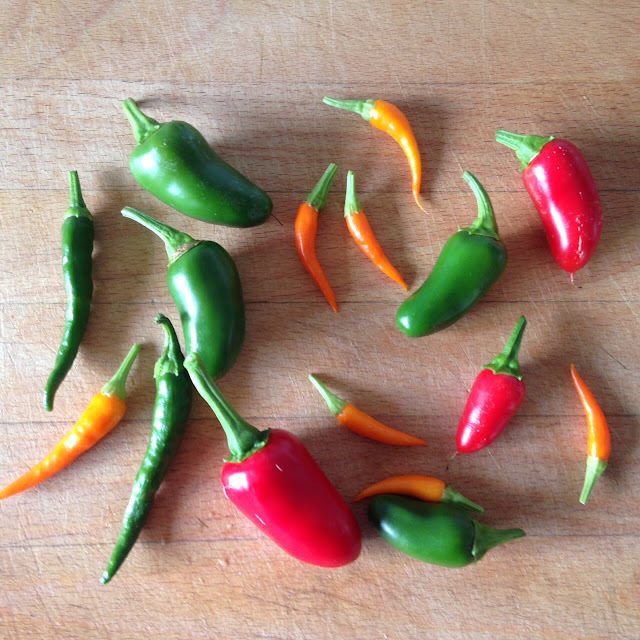 This year, having been given some seeds for Christmas, I thought I'd have a go at growing chillies. I had attempted them before in the polytunnel last year but anyone who reads this blog regularly knows that the tunnel blew away before they came to anything. This time around having less growing space I have kept them inside on a relatively sunny windowsill. I started them off in individual pots back in late February, sowing three or four of each. Somewhere along the line the labels got mixed up which isn't unusual for me so when I potted them all into one long pot for the windowsill I chose the six strongest plants to grow on. It turns out I ended up with one cayenne, three raam, and two sweet sunshine. The raam did turn out to be quite hot which is no bad thing for me so having three of these was a real result. I started harvesting these early September and am still harvesting them now, fantastically productive, they will definitely make the cut next year. The sweet sunshine was slow to get going and made me doubt whether it was ever going to get any bigger. It did in the end and I have been harvesting these for the past couple of weeks. Being the slowest to grow and the smallest crop, while they have been enjoyable I think they'll be replaced with something more substantial next year. The cayenne have fallen somewhere in between the two above in heat, growth speed and overall harvest. However these have proved to be excellent for drying and will prolong my harvest for many months to come. Surely I'll have room for a couple of these come next spring. At one point we were facing a real glut and running out of ideas of what to do with them. Of course the only answer was homemade curry paste. Put in the blender with lemongrass, onion, garlic, ginger and some tomatoes they made an nice, coarse paste. Using different quantities and combinations of the chillies we ended up with a mild and a hot paste that should keep for a good couple of months. All in all definitely something I'll be experimenting more with. I'd encourage anyone to grow them, taking up minimal space and giving maximum reward they've been a real success.